Straight Shots Do It Again! In a whirlwind march to the Championship, Straight Shots dug deep and came up victorious! No strangers to playoffs, Straight Shots relies both on their veterans, rookies, and players returning to the court from injured reserve to bring the champs wristbands home. 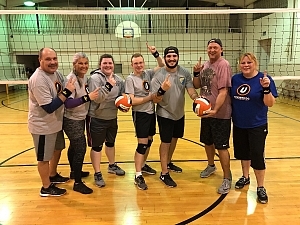 Throughout playoffs, each team member got to show off their skillz- Kevin going hard at the net, Renee coming in big with impossible digs on defense, and Jeff was a brick wall of blocks. And throughout the night it was clear that no matter how good they are at the sport, Straight Shots really shine when showing off their Ubderdog spirit. These guys have a great time with each other! Congratulations on your championship season!